Time for another review! This time I’m taking a look at Resinya’s 1/6 Galett Fey Sowauge completed PVC figure. Galett is a princess hailing from the Shina Dark manga series. Judging by the way she carries a sword, along with her fierce expression, we can also assume that she’s also a capable warrior. 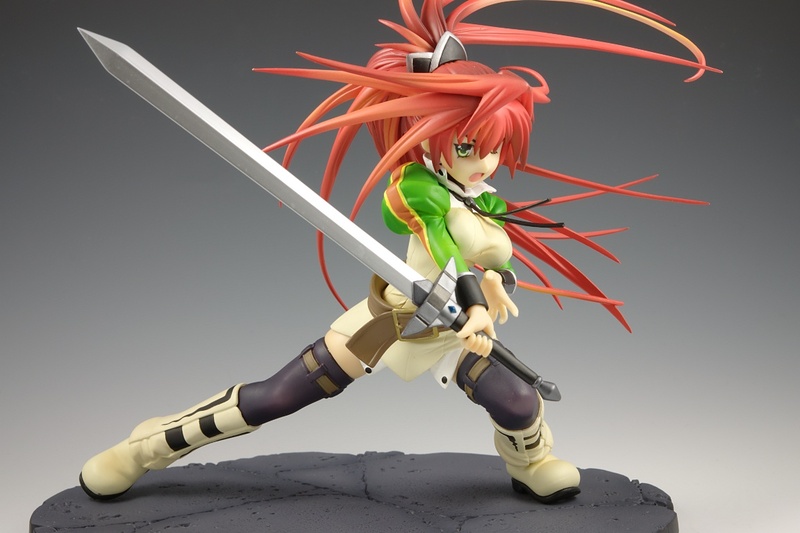 Galett was right at the top of my must-have list–after GSC’s Black Rock Shooter–going into 2010. Thankfully, Hobby Search was still taking preorders as late as January, so acquiring Galett proved to be a minimal amount of work. I get the impression that this figure has been largely ignored by collectors, at least in the English-speaking world. 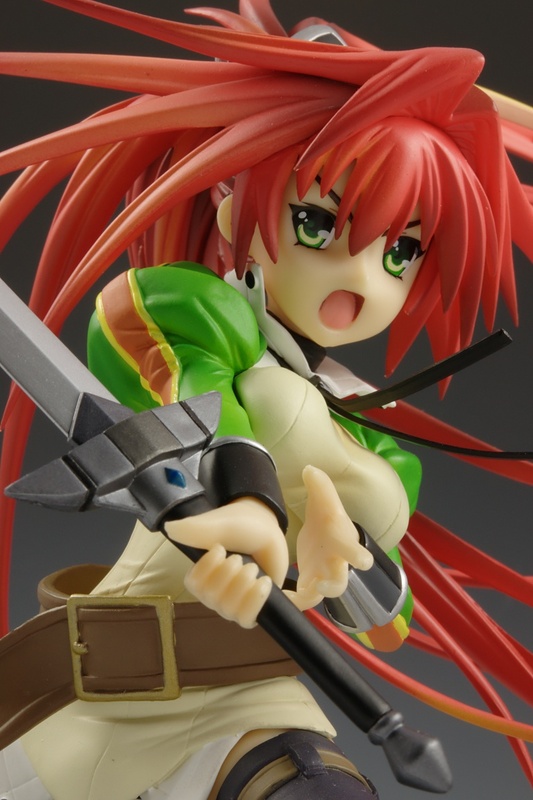 Ordering the figure less than a month prior to release wasn’t particularly difficult and I was unable to find any other reviews for Galett at the time of this writing. I must confess to being initially somewhat disappointed with Galett. Resinya’s pre-release model looked nothing short of spectacular so some level of disappointment with the final PVC was almost inevitable. Initial impressions don’t always tell the whole story, though. I had very similar reactions when I first received my Clayz 1/6 Saber–a figure I now consider an unequivocal favorite–back in 2006. Bigger is better — Resinya has a clear track record of favoring 1/6 and 1/7 scale figures, so it’s no surprise that Galett lands in this range. I prefer larger figures because they tend to be more detailed than the standard 1/8 scale figure. In addition, I feel like 1/6 scale hits the sweet spot in terms of filling out the bookshelves I use to display my figures. Terrain base — Resinya includes a plastic base detailed to look like cracked earth. 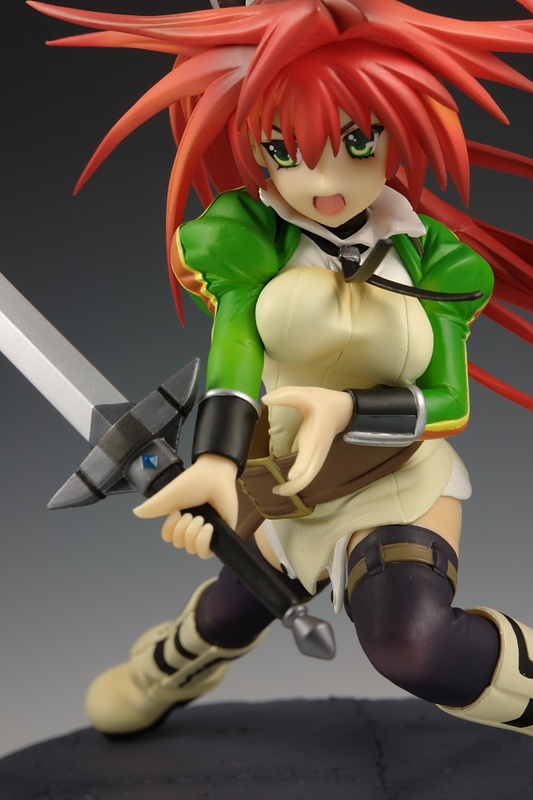 If you have seen Max Factory’s Etna figure, the look is very similar. It’s not on the same level as GSC’s awesome Saber Lily base, but detailed bases are still fairly uncommon and this one complements its figure well. 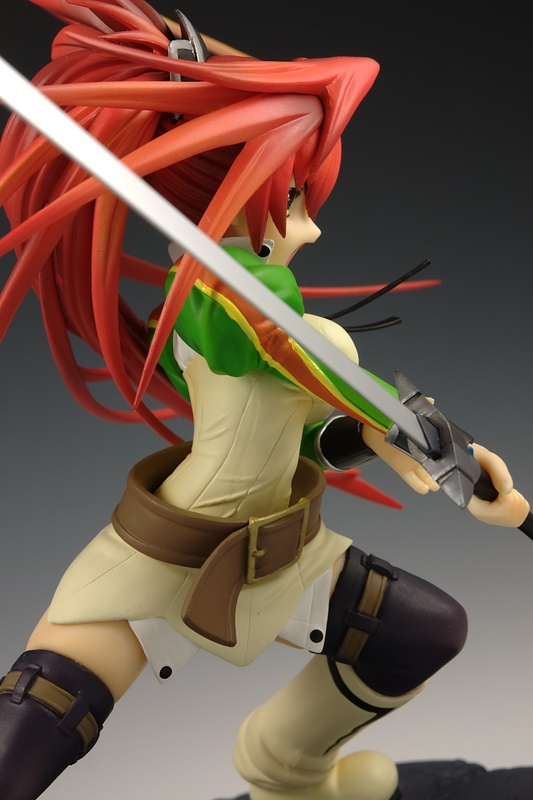 Nice hair — Galett has some of the most impressive hair I’ve seen anywhere in a figure. Numerous individual locks flow out in different directions to form a wide arc tracking the path of Galett’s sword. There are no unsightly seams and this is also where you’ll find the best paint work on the figure. The only thing I don’t like about Galett’s hair is that it tends to obscure her face when viewed from a top-down angle. Base fit fail — While I appreciated Resinya’s attention to detail regarding the looks of Galett’s base, I wish they had done a better job ensuring that she fit into it properly. It took some moderate pushing and pulling to coax each foot into its intended pegs, which is always worrisome because you don’t want to apply too much force. You only have to do it once and it doesn’t diminish the visual appeal of the figure, but it’s still annoying when figures don’t simply snap into place. Final PVC color changes — For reasons I’m still having trouble comprehending, Resinya decided to make a couple substitutions in Galett’s wardrobe between the pre-release model and the final PVC. Galett’s belt has been changed from a dark brown to a lighter brown and her dark brown boots are now a light tan matching her leg-warmers. The more I look at these differences, the more I’m convinced they are changes for the worse and they have a subtle, but significant impact on the overall figure. 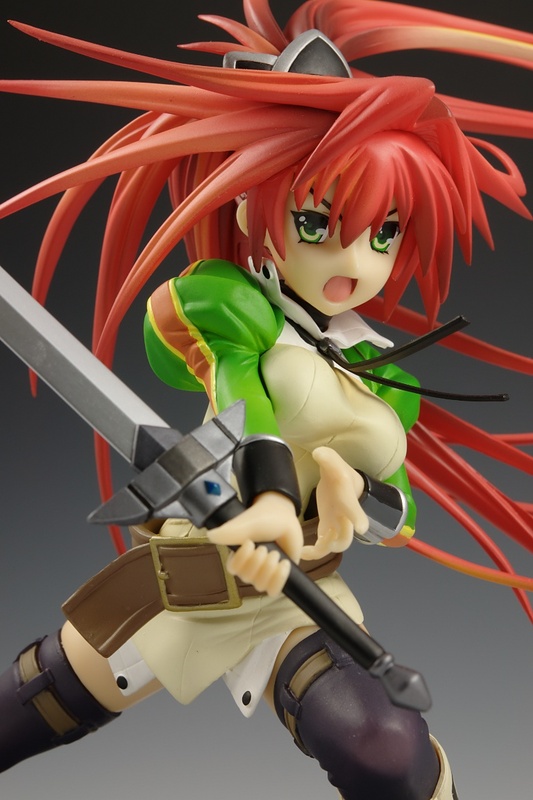 During the course of working with Galett for this review, I largely managed to get over my initial disappointment and find quite a few things I like about the figure. The figure’s strongest points are an attractive, dynamic pose that is (mostly) well-modeled and neatly painted. 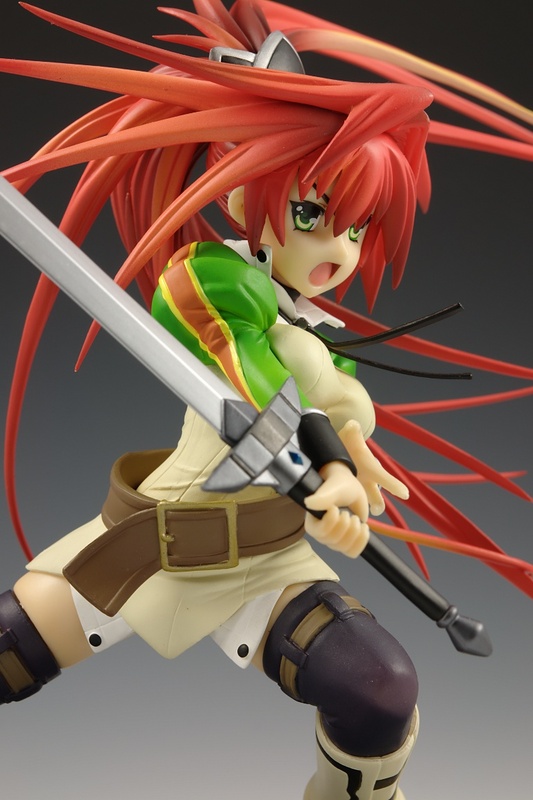 I don’t understand Resinya’s seemingly arbitrary decision to alter the color on portions of Galett’s outfit between the pre-release model and final PVC. I wouldn’t say they ruined the figure in doing so, but I do feel that they stepped outside the bounds of what is normal and necessary in the process of transitioning a hand-painted model into mass production. Unfortunately, language barriers being what they are, it’s difficult for me to properly convey this concern back to Resinya for consideration on future products. The rest of this post is financial and technical data I’ve recorded about this figure to (hopefully) make you a more informed buyer. Click through if you’re interested. PS: This is the first time I’ve included this kind of detailed data in a review. I’m hoping it will prove useful for others when estimating the total cost to buy and ship figures. Please provide feedback as to whether or not you find this data useful. This entry was posted in Figures, Reviews and tagged 1/6 scale, Galett Fey Sowauge, PVC, Resinya!, Shina Dark. Bookmark the permalink. You’re getting pretty good with that camera! One of the reasons I didn’t order this was because I had no idea if Resinya made good or bad figures. The prototype shots made the figure look good, but you never know. From your pictures it looks okay enough to wait to scoop this up when it hits the sales bin. I’ll keep it in mind. I believe Resinya is the name of Cospa’s figure line if that helps. The Cospa and Resinya names seem to be used almost interchangeably, which tends to cause confusion (or at least it did for me). Quality-wise, I think this is an average figure. She’s solidly built, but the paint work isn’t anything special. I think they could have done a better job in a few areas with the sculpt (e.g., her hands). PS: Thanks for stopping by. HappySoda is definitely one of the major sources of inspiration for this blog.